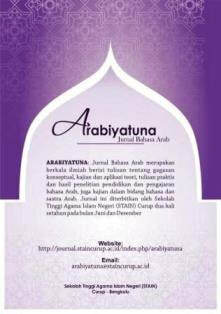 Arabiyatuna : Jurnal Bahasa Arab, is a scientific journal focusing about conceptual ideas, study and application of theory, practical writing and research results of education and teaching of Arabic, as well as in Arabic language and literature. The journal is published by Sekolah Tinggi Agama Islam Negeri (STAIN) Curup, online and printed twice a year, in June and December. The managers invite scientists, scholars, professionals, and researchers in the Arabic Language discipline to publish their research results through a selection of manuscripts, review of partners, and editing processes. Scholar Article Impact Factor does not guarantee any accuracy of journal information in this page. Please contact journal administration or editor through their website for any query or specific information, journal status and latest updates. Thank you.